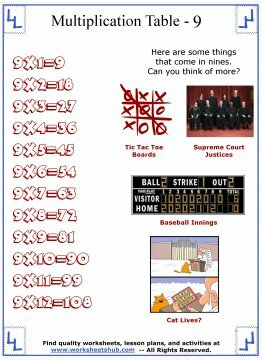 These printable multiplication tables are great resources for displaying on a bulletin board in a classroom or for using as a reference sheet. 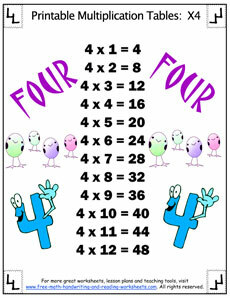 Each one shows all of the possible factor combinations for the numbers one through twelve. 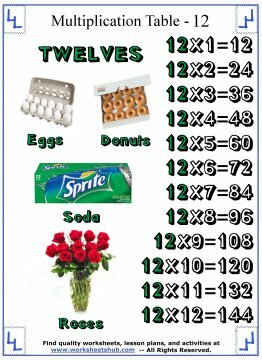 If you need a smaller, more concise reference sheet, you may consider printing off a multiplication table that covers all the factors for multiples of numbers up to 12. 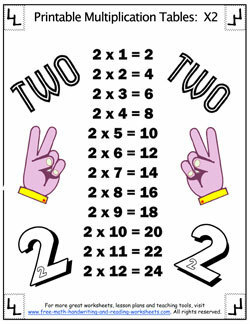 The free multiplication tables below can be downloaded to your own computer and printed out. Whether your child is home-schooled or attends an elementary grade school, we’re sure you’ll find extra practice is beneficial for them. 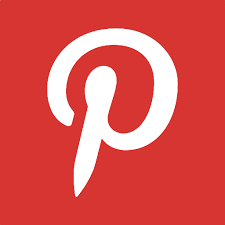 Click the image to download and print. 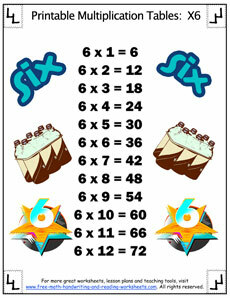 Here are the first six sets of multiplication tables. I'll be working on creating the rest later (it's a busy summer day and I've been in front of the computer too long). 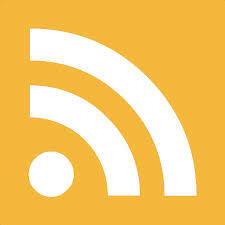 To print out your tables, just click on the images below, download the PDF file, and then print it out. Update: I just added the tables for seven, eight, and nine. 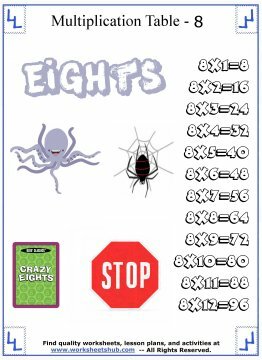 Instead of just having the tables with some pictures, I've added more detailed info for each set of multiplication facts, for example on the sevens times table I included graphics of things that come in sevens. I thought it might make the tables a bit more interesting for students. 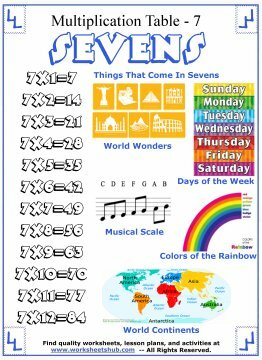 See if you can have your students come up with more things that come in groups of sevens, eights, and so on. 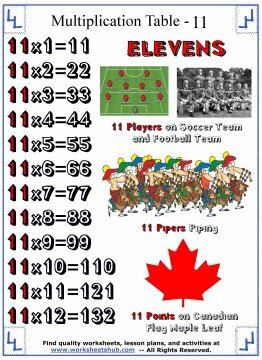 Yet Another Update: Alright, I finally finished creating multiplication tables for the ten, eleven, and twelve. These are probably my favorite ones so far. 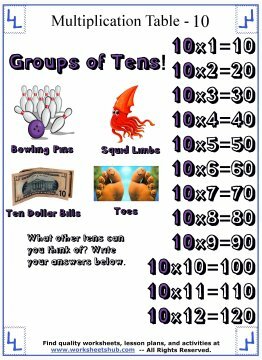 I hope you can use these either at home or in the classroom to help your students begin learning their multiplication facts. 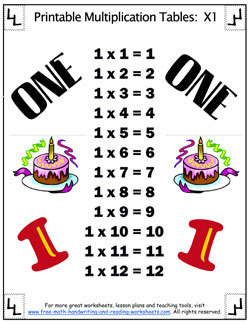 If you are simply trying to help your child review the tables for regular elementary school work, you may want to check out these lessons on How To Teach Multiplication. 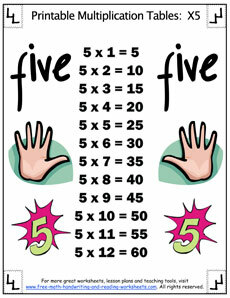 Sometimes the child simply needs some basic review of skip counting and other beginning methods. 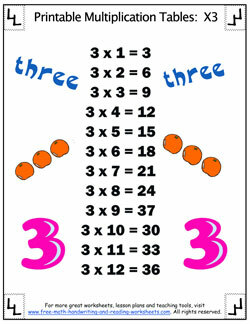 You can find more resources and worksheets covering multiplication using the links below.